Peaches are a significant part of the South’s fresh-produce industry. But since several insect pests pose serious threats to southern peach orchards, growers must often resort to costly pesticides to protect their fruit. At ARS’s Southeastern Fruit and Tree Nut Research Laboratory in Byron, Georgia, entomologists David Shapiro-Ilan and Ted Cottrell are seeking environmentally friendly alternatives. In cooperation with Russ Mizell at the University of Florida and Dan Horton at the University of Georgia, the ARS researchers are evaluating two tiny, soil-dwelling nematodes as possible biological controls. Plum curculio, Conotrachelus nenuphar, is a tiny, snout-nosed beetle and major pest of stone fruits, including peaches. Adult insects damage peaches through feeding on and laying eggs in the fruit, resulting in characteristic crescent-shaped wounds on the fruit. Infested fruits often fall prematurely and are unmarketable. Later, mature larvae emerge from the fruit and develop in the soil, completing the insect’s life cycle. Stone fruits are also plagued by clear-winged moths such as the peachtree borer, Synanthedon exitiosa, and the lesser peachtree borer, S. pictipes. Another beneficial nematode, St. carpocapsae, is virulent to both closely related hosts. With peachtree borers, field applications of the St. carpocapsae nematode achieved high levels of borer control. That’s in part because the nematodes were protected from desiccation (drying) and ultraviolet damage by their subsoil environment. 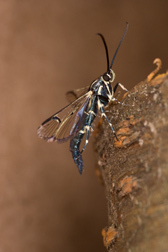 Though they knew from laboratory studies that the lesser peachtree borer is also highly susceptible to St. carpocapsae, Shapiro-Ilan and Cottrell realized that its control would be more difficult. That’s because lesser peachtree borers attack trees aboveground, feeding in galleries within trunks and limbs. Technician Rebekah Long sprays beneficial nematodes onto a tree wound to control lesser peachtree borer. Technician Chris Paulsen prepares to apply a bandage to protect the nematodes and prolong their survival. 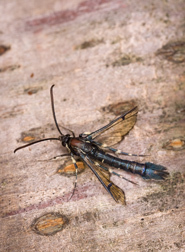 “Initially, we just applied nematodes to lesser peachtree borer wounds, and—as expected—the nematodes failed to cause any significant suppression,” says Shapiro-Ilan. But the researchers then found that when nematodes were given adequate protection, they provided a high level of borer control. 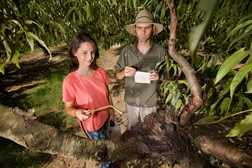 This suggests that further research will help peach growers make significant headway against these troublesome pests.—By Sharon Durham, Agricultural Research Service Information Staff. 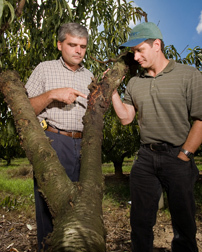 David Shapiro-Ilan and Ted Cottrell are with the USDA-ARS Southeastern Fruit and Tree Nut Research Laboratory, 21 Dunbar Rd., Byron, GA 31008; phone (478) 956-6444 [Shapiro-Ilan], (478) 956-6448 [Cottrell], fax (478) 956-2929. "Nimble Nematodes: Testing Biocontrols for Peach Pests" was published in the March 2008 issue of Agricultural Research magazine.